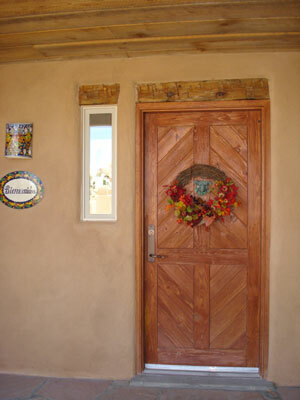 All of Iliff Construction's custom homes are built to withstand the extremes of the New Mexico climate. Many of the unique architectural elements of the southwest must be treated, dried or protected from water and freezing. For example, wooden window headers or lintels need to be treated or aged before using. If new untreated wood is used, it will warp and compromise the window frame. The flat roofs of the southwest style are not really flat; they are slightly pitched toward one side. Iliff Construction always uses a series of "crickets" on the low side where the roof intersects the parapet wall. These crickets are built up ramps between the canales designed to direct water to the canales and keep the water flowing off the roof. This picture shows the inclined crickets on the right, with the flashing of the canales extending well into the slope. 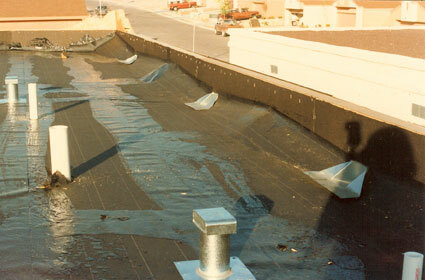 Since we also get a few inches of snow, which melts very fast, it is important to keep the water flowing off the roof. Like many other Iliff improvements, this is an inexpensive project during construction that will pay dividends in the years to come. The sill plate (or mudsill) is the framing member which sits directly on the foundation. Code requirements specify that the only outer wall's sill be constructed of treated lumber to resist rot and termites. However, termites can invade through any small crack in the foundation, not just the outside. Therefore, Iliff treats all the sill plates throughout the entire house. Every piece of framing lumber that comes in contact with the cement foundation is treated, discouraging termites and wood rot. Rigid ductwork is better than flexible ductwork for three main reasons. Smooth pipe is less resistant to air flow, allowing the air to flow faster with less effort. Rigid pipe is less susceptible to air leakage, as it can be attached to other pieces of pipe without gaps. Rigid ductwork is easier to have cleaned than flexible or pleated ductwork. Advancements in insulation, solar energy and low-maintenance building materials are changing daily. Iliff Construction works with the homeowners to include energy-saving projects in all phases of construction. Many of these projects are eligible for tax rebates or selling excess electricity back to power companies. The Albuquerque area has many reputable solar-energy contractors to choose from. With 310 days of sunshine, solar systems are practical and efficient; and the prices for these new-construction systems are coming down as the industry matures. Iliff Construction has installed many in-slab radiant heat systems in the area. When used with the traditional saltillo tile floor, this method of heating is quiet and provides toasty warmth in all, or selected areas, of your home. Once limited to only high-end homes, this technology has become affordable to a larger percentage of homes. 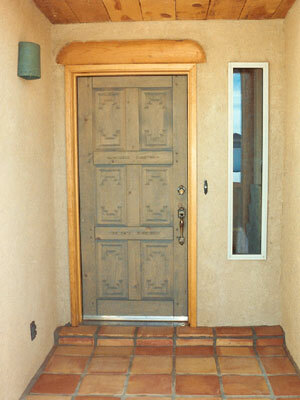 Iliff Construction is located at 6004 Rio Salado Loop NE, Rio Rancho, NM 87144. New Mexico Contractor's License: GB-98 #82925.